USA Pan Jelly Roll Sheet Pan 13 x 18 x 1 Usa Pans are exactly as the name states "Made In The USA!". All Usa Pans are a commercial grade heavy gauge aluminized steel.The Pans are made from 65% of recycled steel and are oven safe up to 450 degrees F. These pans are recommended hand wash only and are reccommended for use with silicone tools only. These American made pans are some of the highest quality products on the market today. Get yours with 100% American made quality. This Jelly Roll Pan features straight sides and a thin 1 inch thickness to ensure perfect jelly roll creations. The Jelly Roll Pan is a 13 x 18 design and works great for many things, not just jelly rolls. 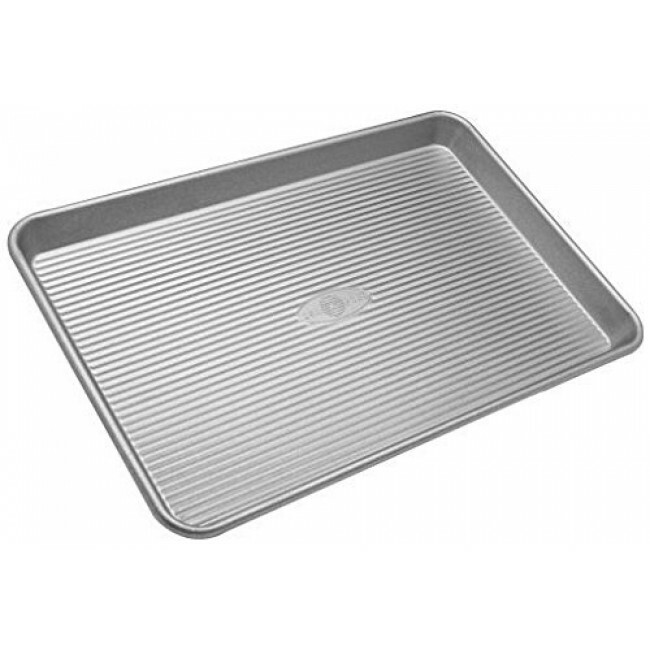 USA Pan Jelly Roll Sheet Pan 13 x 18 x 1 Features: Made in USA Made from 65% recycled steel PTFE and PFOA free Fluted Surface Oven safe to 450ºF Hand wash only Use only silicone, nylon or wooden utensils Measures 18" x 14" Looking For More USA Pans?